I’ve been working on this piece for an embarrassingly long time. But as I’ve mentioned before, hand embroidery tends to be slow going. Having done a lot of pop-culture inspired art this past year, I was looking to create something more natural and organic.That being said, I still wanted to focus on imagery that would be fun and unique, able to hold my attention for the many weeks I knew it would take to complete. 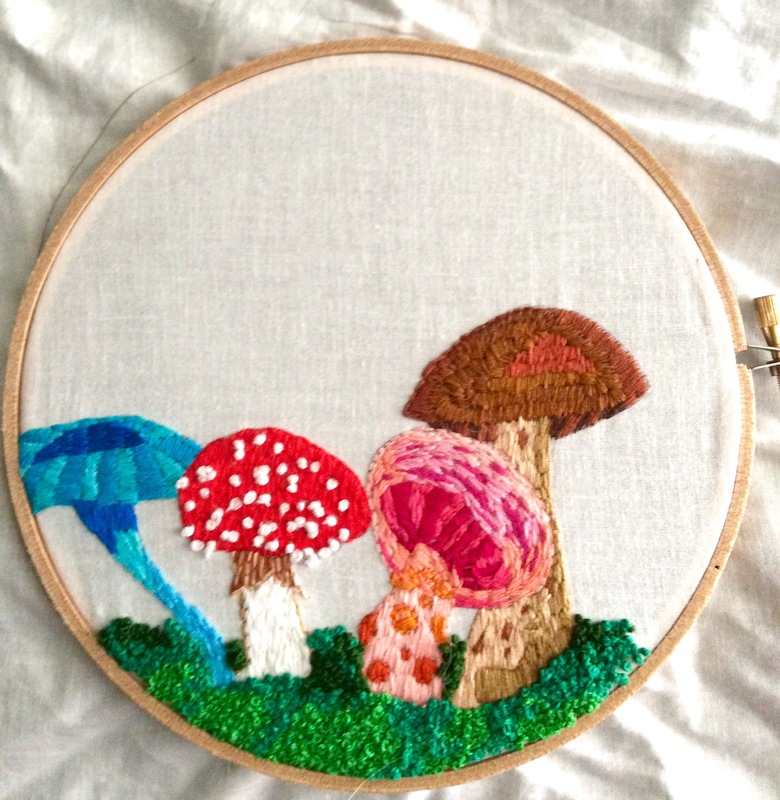 I’ve always enjoyed mushroom imagery but had yet to create an embroidery piece. This seemed like as good a time as any. After doing a little bit of research, I was able to find images of mushrooms of all different shapes and colors, and arranged the composition so that the hues would be well-balanced across the hoop. After completing the initial sketch, I made small notes to myself so I would remember which colors were to be filled into which designated areas. This can be a useful tactic, especially when working on a piece that you know will take you a significant amount of time. If you no longer are in possession of the reference images, you want to remember your initial color plan. 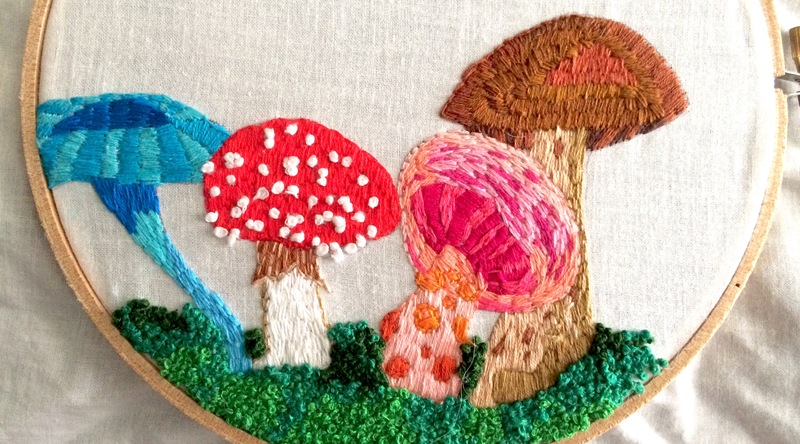 Once I had finished embroidering the mushrooms, it was time to focus on the surrounding area. I decided to add moss under the mushrooms, grounding them in the designated embroidery hoop space. Similar to what I had done with the spots on the red mushroom, I used French knots to create texture that would mimic moss. Although time consuming and daunting to some, I absolutely adore French knots. They proved to be especially useful in this particular situation, providing the texture I desired. Although time consuming, I am extraordinarily pleased with how this piece turned out. Bright, fun, organic and original, it was well worth the wait.